Photograph of Joseph H.W. Roux’s recognition plaque, located in Manchester NH at the NW corner of Bartlett and Amory Streets. Copyright of Martin Miccio for the City of Manchester, and used here with permission. On December 16, 1947, the city of Manchester’s Mayor and Board of Alderman approved an ordinance: “That the square located where Amory Street, Montgomery Street and Bartlett Street intersects, be officially designated… as Joseph H.W. Roux Square.” The memorial plaque sits on the NW corner of Bartlett and Amory Streets, and reads: S/SGT. JOSEPH ROUX AAF. BORN JULY 30, 1921. DIED SEPTEMBER 8, 1943. GERMANY. Joseph H. Wilfred Roux was born on the 30th of July in 1921, the eldest son and second child of Oscar & Roy) Roux. He attended local schools, reportedly graduating from St. George’s Grammar School, and in his senior year at Central High when he left to enlist in the Airforce (October 1940). As soon as WWII started it was recognized that U-boats posed a serious threat to the US East coast and in response the Army converted a number of bomber squadrons to an anti-submarine role and eventually organized them formally as Anti-submarine Squadrons. By 1943 Joseph Roux was a member of the US Army’s 4th Anti Sub Squadron, that flew out of St Eval in Cornwall, England and later from Dunkeswell in Devon, England. The 479th ASG moved to Dunkeswell on the 6th August 1943. On September 8, 1943, S/Sgt. Joseph H.W. Roux was among a crew on a B-24 of the 479th, 4th A.S. Squadron that failed to return from patrol. They had met action over the Bay of Biscay, and on 11 September three survivors were rescued from a dinghy, but Joseph Roux was not among them. He, along with the other men listed below, perished that day, and received the posthumous award of Purple Heart. Marker request for Joseph Roux by his father Oscar in 1958. 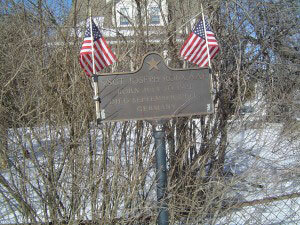 Joseph Roux’s Military Square plaque is erroneous in that it indicates he died in Germany. The records seem clear that he along with most of his crew mates were killed over the Bay of Biscay. 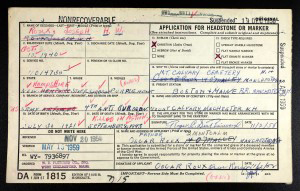 Joseph’s body was not recoverable, but in 1958 his father, Oscar, requested an official military marker, that was placed to honor his memory in Mount Calvary Cemetery in Manchester, New Hampshire. In addition there is a marker in Cambridge American Cemetery and Memorial, Coton, Cambridgeshire, England.